MG Hector spotted testing with Hyundai Tucson and Honda CR-V! MG Hector spotted benchmark testing with Hyundai Tucson and Honda CR-V! MG Hector with be the British automaker’s first vehicle in the Indian market and is expected to cost somewhere in-between the mark of INR 12 – 18 lakh. MG Motors India is all set to make its debut in the Indian market with an urban utility vehicle which is going to be called as the Hector. Though its is expected to be priced in-between INR 12 lakh to INR 18 lakh, and compete with the likes of Tata Harrier and Jeep Compass, it will have bigger, full-sized SUV exterior dimensions. Hence, in terms of outright road presence and interior cabin space, the MG Hector will match up to SUV placed a segment above. 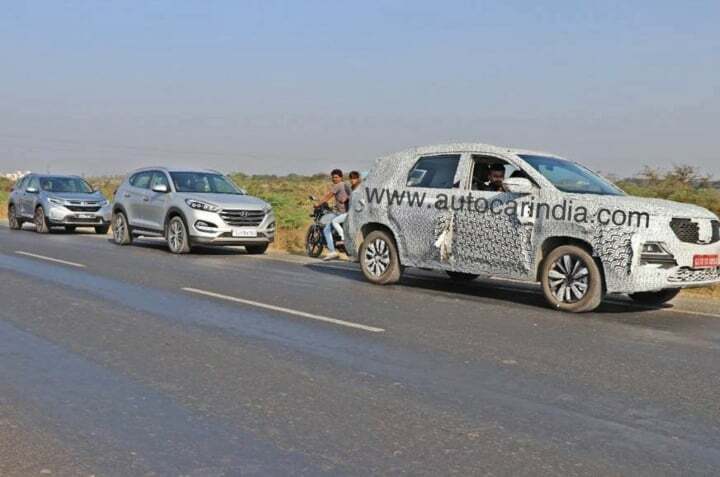 A new spy image adds further weight to the statement as in here we can see the Hector’s spy mule in a possible benchmark test against the Honda CR-V and the Hyundai Tucson. The MG Hector is based on the same underpinnings as that of the Baojun 530. Not only this, but going by recent spy shots of its test mules, it seems that it will borrow majority of its styling cues from the said SUV as well. We are expecting the Hector to come across as a premium alternative to its competition. Hence, we are likely to see it come with a feature loaded cabin that also offers a host of creature comforts as well. Features such as LED projector headlamps, LED daytime running lights, automatic climate control, automatic headlamps, rain-sensing wipers, dual-zone climate control, leather upholstery, soft-touch dashboard are some of the things that are likely to make the cut for this SUV’s equipment list. In addition to these, the Hector is also going to offer a decent list of activ as well as passive safety features onboard. The engine specifications of the MG Hector include both petrol as well as diesel engine options. The petrol derivatives are going to offer a 1.4-litre Multi-Air unit. This engine is capable of churning out 162 BHP along with 250 N of peak torque. The diesel engine, on the other hand, is going to be a 2.0-litre Multi-jet unit. This engine will churn out 170 BHP of power along with 350 Nm of peak torque. Both manual, as well as automatic transmission options, will be on offer. We expect the petrol engine to promise a fuel-efficiency figure of around 12-14 km/l. While the mileage figures for the diesel engine are going to stand at 17-18 km/l.